While Hezbollah’s military expansion across the Middle East, particularly since the start of the Syrian conflict in 2011, has drawn a great deal of attention, the Lebanese organization’s efforts to increase its presence and influence in Africa has largely been overlooked. Nigeria is a case in point. Sources close to Hezbollah say the organization provides ideological and military training to Nigerian Shiites inside Lebanon. Tall men, in long, traditional African garb specific to northern Nigeria are sometimes spotted in Dahieh, a predominantly Shiite suburb south of Beirut where Hezbollah runs a cultural center. According to sources close to Hezbollah commanders, Nigerian men receive “training courses” at this center. “The training is limited to a few number of people but it is growing steadily,” one source confirmed, speaking to the author on the condition of anonymity. “The Shiite Nigerians initially receive a religious training before a military one that is provided in two camps in the Lebanese Bekaa,” he noted. While it may seem as something of an oddity, the proselytization of Nigerians dates back to more than three decades ago. Nigeria is home to the Islamic Movement in Nigeria, a jihadist organization founded in the early 1980s with a strong support among the country’s five million Shiite Muslims. In the wake of Iran’s 1979 Islamic Revolution, many young members of Nigeria’s Muslim Student Society, for example, traveled to Iran and received monetary aid as well as military and religious training. The leader of the group, Sheikh Ibrahim Zakzaky, a Sunni demagogue hailing from the town of Zaria, was initially inspired by Muslim Brotherhood’s chief ideologue Sayyed Qutb. But he later converted to Shiite Islam and became a flag-bearer for Iran’s revolution in his native country. Zakzaky believed that the establishment of an Islamic republic similar to Iran’s was potentially feasible in Nigeria. Since then, Zakzaky has had numerous confrontations with the government. He was jailed from 1981 to 1984 on charges of sedition, as he had reportedly declared he would recognize no state laws or authority except those of Islam. The movement’s popularity also increased in the backdrop of escalating Sunni-Shiite tensions and its armed clashes with the Nigerian State. In 2015, Nigerian troops killed more than 300 Shiites in Zaria and arrested Zakzaky and hundreds of his followers. The army had accused the Shiite group of attempting to kill Nigeria’s army chief-of-staff, a charge the movement denied. As a result, the Nigerian government outlawed the IMN. Zakzaky remains in jail. In 2016, Northern Nigeria witnessed another conflict as part of broader proxy war between Iran and Saudi Arabia. Violent clashes erupted between supporters of rival groups from the two main branches of Islam namely the Izala movement, backed by mainly Sunni Saudi Arabia, and the Shiite IMN. Now, Hezbollah and Iran appear to be upping the ante. 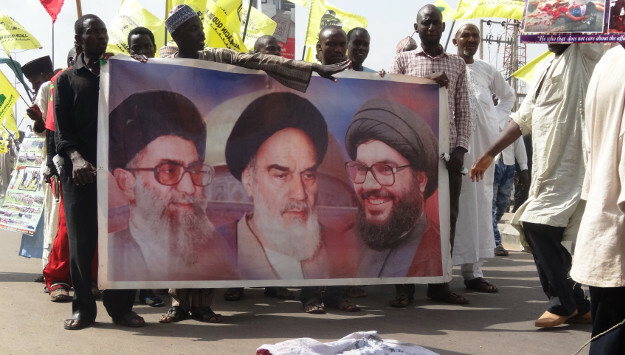 The increased proselytization and militancy effort by Hezbollah toward Nigerian nationals seem to be driven by local and international dynamics. “Iran has told Hezbollah that it needed to recruit and train Nigerians to establish a stronghold there so that it could serve as an operational base for the rest of Africa, mainly to thwart Israeli and western ambitions in the region,” says the source. An article published in CNN had in the past highlighted as well that IMN was providing Hezbollah-style military training to hundreds of Nigerians in camps throughout Northern Nigeria. Another reason may that driving Hezbollah’s is linked to local calculation as its some members of its popular constituency wish to undermine rival Israeli companies in Nigeria . Some of them according to the source, appear to be allocating Hezbollah’s with funds for its Nigerian operation. The author has not been able to independently confirm the two statements, however. Lebanese businessmen have nonetheless been linked to Hezbollah operations in Nigeria. In 2013, Reuters reported that Nigerian authorities had arrested three Lebanese nationals in the northern Nigeria’s city of Kano. The men had admitted to being members of Hezbollah and a raid conducted on the residence of one of the Lebanese led to the discovery of a large stash of weapons, including anti-tank weapons, landmines, rocket-propelled grenades, AK-47s, and some dynamite. Reuters had quoted the city’s military spokesman Captain Ikedichi Iweha as saying that the arms and ammunition were to be used for operations against Israel and Western interests in Nigeria. However, the current training program in Lebanon for Nigerian Shiites is limited in scope, at least for now. “The training that is taking place now in Lebanon is mostly focusing on higher-ranking officers in commanding positions, who can in turn train new recruits in Nigeria, which is why the number of trainees remains limited. These trainees also generally return to Lebanon every three to six months to receive further training on more sophisticated weapons,” explained the source. But an official at the Lebanese Interior Ministry, requesting anonymity, said the ministry was unaware of large numbers of Nigerian recruits coming into Lebanon. The Nigerian embassy in Brussels could not be reached for comment. The IMN appears to have also emulated Hezbollah’s extensive and successful propaganda and outreach programs. A Bloomberg report had noted last year that the IMN propaganda was very similar to that of Hezbollah. IMN had begun broadcasting its own internet-based Hausa radio station, Shuhada, and had plans to start a new TV channel. It also runs a newspaper called al-Mizan. In addition, the organization, according to Bloomberg, boasts more than 300 schools, Islamic centers, security guards and a “martyrs’ foundation” funded mainly by member donations. This network bears striking resemblance to Hezbollah’s welfare systems and media operating model. Iran and Hezbollah’s drive into Africa is both geopolitical and ideological. With limited means, Iran has been able to project power and influence across regions. While majority of Shiite communities in the Middle East and North Africa are loyal citizens and refuse to accept Iranian dictates, the Islamic Republic has managed to exploit local grievances of some Shiite communities for its geopolitical ends. Iranian and Hezbollah efforts also risk exacerbating sectarian strife in in Nigeria, which is home to a large Sunni community. Hezbollah has proven to be Iran’s successful foreign policy tool in that regard, thanks to its high military capabilities, its connections across Africa through its constituency, and its experience in foreign covert operations.